Anari is a Cypriot soft cheese and this easy dessert is a sort of Cypriot cheesecake. It is very refreshing and very tasteful. Whip the cream and add the icing sugar and the vanilla and when peaks form, place in the refrigerator. Roast the walnuts in the oven until browned (about 20 minutes). Remove and let them cool down. Then cut them into smaller pieces. Put sugar, lemon juice and water in a small saucepan or frying pan and stir until browned. Add walnuts and mix. Place the caramelized walnuts on parchment paper and allow to cool. Break into smaller pieces in a food processor. Crumble the cheese and with a fork or by hand mixer mix until smooth. Add the sugar, the whipped cream (2/3) the cinnamon and blossom water and mix until creamy. Place a layer of biscuits in a pyrex or plastic rectangular vessel. 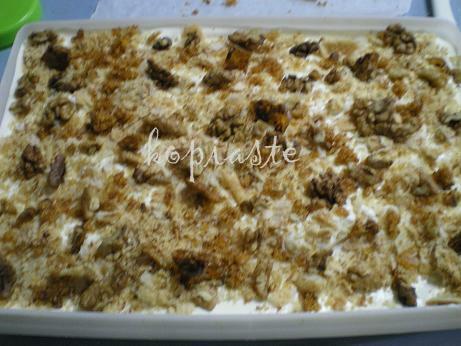 Sprinkle on top the caramelized walnuts and then another layer of biscuits. If there are not enough you can split them in two pieces. Keep the broken ones, which crumble on top with walnuts. Always keep in the refrigerator and serve cold. Note: Walnuts may be substituted with your favourite nuts. Ivuy, this is another new desseret for me…keep on posting these unique Cypriot dishes…I love it!